The Friends of Camp BATAWAGAMA are proud to sponsor Elvis Tribute artist Dwight Icenhower, Three time World Champion, at the Windsor Center in Iron River for two concerts this year on Wednesday Aug 3rd and Thursday Aug 4th. Dwight Icenhower is considered to be one of the best Elvis Tribute Artists in the world today. He has mastered the 50’s, 60’s and 70’s era of Elvis’ career and has won a Dwight is recognized not only for his great personality on and off the stage, but also for his amazing voice that has sometimes been mistaken for Elvis himself. He has performed with many of the original musicians who have worked with Elvis including: the Jordanaires, The Stamps Quartet, The Sweet Inspirations, Joe Gerchio, DJ Fontana, and Duke Bartwell (just to name a few). He has taken home over 65 “First Place” awards in contests all over the world; and in 2013, Dwight became the only Elvis Tribute in history to ever win three World Championships “First Place” titles consecutively during Elvis Week, in Memphis, TN. This amazing journey has been a dream come true to Dwight, and he wishes to continue using his incredible talents to keep the memory of Elvis Presley alive for many more generations to come. Returning for the 4th year will be the The EAS BAND from Chicago. Endorsed by Elvis Presley Enterprises/ Graceland, they are respected throughout the industry as the number one touring tribute band. Not only does the EAS Band perform note for note duplication of Elvis’ Music and concerts of over 600 songs, they also provide music of other tribute artists including: The Blues Brothers, Rod Stewart, Roy Orbison, Buddy Holly, Johnny cash, Patsy Cline, The Judds, Reba McEntire, Neil Diamond, Kenny Rogers, and Dolly Parton, just to name a few. The EAS Band is a professional touring Band that performs all over the world backing tribute artists. They are also well versed in entertaining audiences as an opening act or to fill a night of entertainment. The band members have many years of experience performing music from various genres including country, classic to modern rock, Motown, R&B, easy listening, and jazz standards. Jesse Aron is an internationally recognized Tribute Artist. Jesse has been performing professionally since 2003 and has earned his reputation as one of the most accomplished and recognized Roy Orbison tribute artists ever. His Roy Orbison Tribute concerts have been called “Unbelievable” and reportedly have thrilled “Baby Boomers” everywhere. Having performed benefit concerts for Veterans and the Special Olympics, Jesse received letters of recommendation from the past two Governors of Wisconsin for his efforts. Returning for the third straight year was the fabulous EAS Band from Chicagoland. Concert Dates: August 6th, 8th more details to be announced. Bauer recently wrapped up a successful year of touring that included sold out shows in 16 cities in Australia and an invitation to return in again next year for a fourth tour there. Bauer also does an annual tour in Canada. Bauer, who is based in Oklahoma City, has toured extensively throughout the United States and in Mexico, selling out most of the venues he has played. The Friends of Camp BATAWAGAMA are pleased to announce that they have signed the much sought after EAS band from Chicago for the upcoming "Elvis is in the House" concerts on July 10th and 12th at the Windsor Center in Iron River. EAS is the official band of the Elvis Presley Enterprises (EPI/Graceland). They are respected throughout the industry as the number one touring tribute band. Not only does EAS perform note for note duplication of the Elvis music and concerts of over 600 songs, but they also provide music for other tribute artists including : The Blues Brothers, Reba McEntire, Buddy Holly, Rod Stewart, Johnny Cash and Patsy Cline among others. EAS is a professional touring band that performs all over the world. Along with the talented musicians and female back-up singers, all band members sing back-up as well, which gives the feeling and excitement of being at an actual Elvis concert. Local guitar player and area favorite Jack Jacobson and his daughter Julie Jacobson Weaver from Pittsburg, PA will be joining the band for the evening. Jack has been playing string instruments since he learned as a child from his Dad, Paul Jacobson. Julie followed in her Father's footsteps and began playing the violin when she was in the 2nd grade. While going to school and working in Ann Arbor she played with the Ann Arbor Symphony. 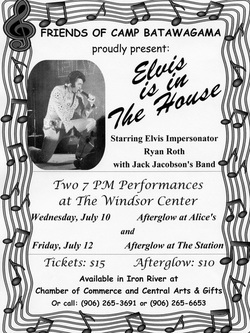 The EAS Band and Ryan Roth have frequently performed together in Elvis impersonator events around the country and are really looking forward to coming to the Iron River area and putting on shows for our community. The members of the FOCB Board are making plans to show them the many beautiful sights in Iron County while they are here. If you happen to see them when you are out and about please introduce yourself and welcome them to the area. Tickets are selling fast for both concerts and the "Afterglow events following the concerts. Tickets can be purchased for $15.00 at the Iron County Chamber of Commerce and Central Arts in Iron River. The Afterglow event for the concert on the 10th will be held at Alice's and at The Station on the 12th in Iron River and tickets are $10.00. For further information please contact Jeanne Bonetti 906-265-9069 or Margee Brennan 906-265-3691. All proceeds from the concerts and Afterglow events go toward maintaining the traditional programs that benefit the seniors and children who attend Camp BATAWAGAMNA.